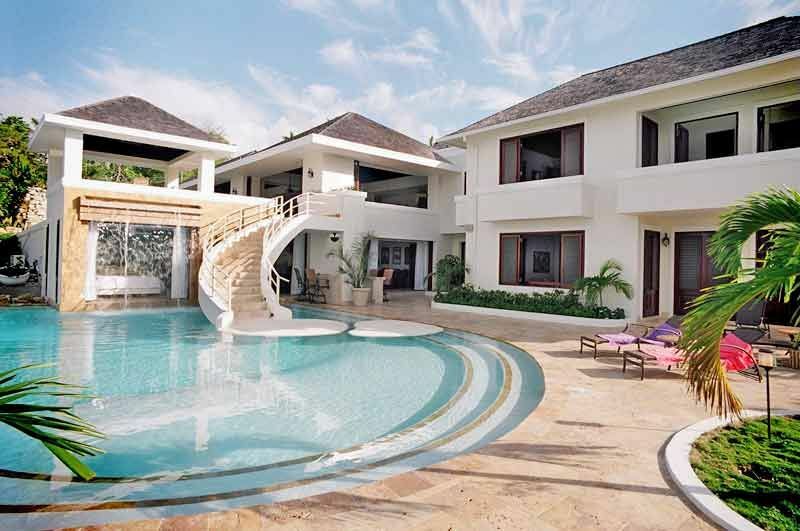 Trinity is a sprawling paradise boasting extraordinary views, two full sized swimming pools, Sonos music system throughout and is the only Tryall villa fully equipped for wheelchair access, including a state of the art custom wheelchair stair lift by Savaria, Inc. Along with the great views and fun pools, Trinity’s exteriors boast sensational gardens profuse with flowers, gentle waterfalls and a sunny gazebo cooled by mountain breezes. The interior has gorgeous living areas (including a cigar room) and exceptional attention to detail making it a truly luxurious place to be. Completed in January of 2007 and designed by world-class architect Thomas Reed, Trinity Villa is nestled on the ridge of Barnes Hill surrounded by four acres of gardens. It comprises 13,000 square feet of covered living space and an additional 6000 square feet of pools and patios. Much of the furniture was designed and created by local craftsman, Trinity’s own Thomas McKenzie. There are five bedrooms in total with two on the main floor and three on the lower level. Each has a king size bed and en suite bathroom with double sink and huge walk-in shower with three shower heads. Three of the bedrooms have private verandas, the fourth opens to the pool deck and the fifth is behind a giant waterfall. A palm lined cut stone driveway welcomes you to the foyer and a vast great room that opens out to stunning views of the Caribbean Sea and countryside. Doors that recess into the walls enable the great room, dining room, bar, library, breakfast area, pool deck and gazebo to flow seamlessly together. Guests can close each day with a different experience at Trinity; sunset cocktails at the gazebo, casual dinners on the terrace; elegant candlelit affairs in the dining room; family movie night in the large media room with an 80” Apple television with Netflix, popcorn machine and individual viewing seats. Or you can retire to the cigar room with a glass of sherry as you watch the sparkling lights of the Montego Bay skyline. Whatever you choose, Trinity and its gracious and welcoming staff of nine - including a superb mixologist - are guaranteed to make it memorable stay.